The Monterey Bay National Marine Sanctuary is one of the best places in the world to see marine wildlife. You can watch sea otters, seals, sea lions, whales, and dolphins any time of the year! Although it may be tempting to approach them for a closer look, all of these animals are protected and it’s against federal law to disturb or harass them. 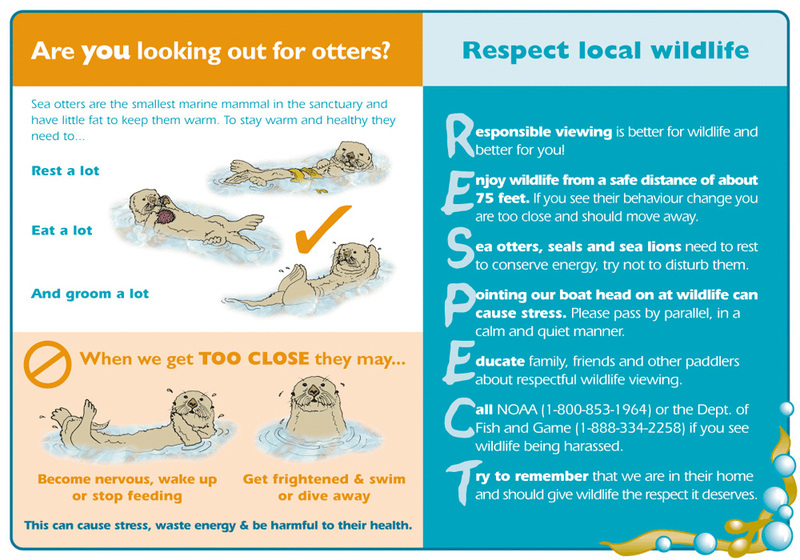 Here are some sea otter viewing tips to help you enjoy watching sea otters and other marine wildlife in a safe and responsible way. By taking simple actions, like keeping a safe and respectful distance away from wildlife, you can do your part to help protect sanctuary wildlife too. Keep your distance! Getting too close to marine life can be stressful and harmful to the animal and its young. It’s also considered marine mammal harassment which is against the law. Please enjoy viewing wildlife from a safe and respectful distance of at least 50 feet. If their behavior changes, you’re too close. Kayakers and SUPs, please be extra careful as you will tend to disturb animals from a greater distance. Never approach wildlife directly (head-on); pass parallel. Photographers, please use a telephoto lens. Watch quietly! Rest is important, especially for moms and pups. By observing wildlife quietly, you’ll also get to see more of their natural behaviors. Slow it down! Boaters should always use caution and keep an eye out for sea otters and other marine mammals. Minimize disturbance by operating boats at slow speeds in and around harbors, near kelp beds, or in other areas where sea otters and other marine mammals may be present. Don’t feed wildlife! Never feed or attempt to attract wildlife with food. It can make them sick and habituate to people. Animals that are accustomed to humans become vulnerable to injuries and can become aggressive and dangerous. Keep pets on a leash! Pets can disturb or harm wildlife, or cause mothers and babies to get separated. Wild animals can also injure or spread disease to you or your pet. Avoid sensitive habitats! From wave-swept beaches and lush kelp forests to tranquil estuaries, the Sanctuary’s near-shore habitats are fragile and full of life. Observe and obey signs directing you away from sensitive and protected habitats. Prevent pollution! Help keep our Sanctuary a beautiful place by disposing of your trash properly and picking up litter you find along the shore. Wildlife can get entangled in plastic or mistake it for food. Report strandings! If you come across a sea otter or other marine mammal you think is sick, injured or abandoned, please call The Marine Mammal Center‘s Stranding Hotline at (415) 289-7325 and report it immediately. Do not attempt to rescue the animal yourself and keep other people and pets away from it. Don’t wrap a sea otter in a blanket because it will quickly overheat. Speak up! Help others become responsible wildlife watchers. Speak up if you notice other viewers behaving in a way that disturbs wildlife. To report marine mammal harassment, call (800) 853-1964. Remember, it’s the law! All marine mammals are protected in the United States by the Marine Mammal Protection Act. California’s threatened sea otters have additional federal protection under the Endangered Species Act. Please respect the protections afforded marine mammals under the MMPA and ESA, and encourage others to do the same. If you come across a sea otter or other marine mammal you think is sick, injured or abandoned, please call The Marine Mammal Center‘s Stranding Hotline at (415) 289-7325 and report it immediately. Do not attempt to rescue the animal yourself and keep other people and pets away from it. Do not wrap a sea otter in a blanket because it will quickly overheat. Sea otters are protected under federal law by the Marine Mammal Protection Act and the Endangered Species Act. Only authorized wildlife professionals are allowed to touch, catch or move them. Untrained individuals who attempt to rescue sea otters may cause more harm than good and may injure themselves in the process. If stranded sea otters are scared back into the water by people or pets, their chances of survival decrease dramatically. Don’t touch it or try to catch it (it’s illegal and they bite). Don’t wrap it in a blanket (it will quickly overheat). Keep people and pets away from it. Call TMMC’s Stranding Hotline at (415) 289-7325. Please view wildlife responsibly and encourage others to do the same. Monterey Bay is a nature lover’s paradise where wildlife is plentiful and easily seen. 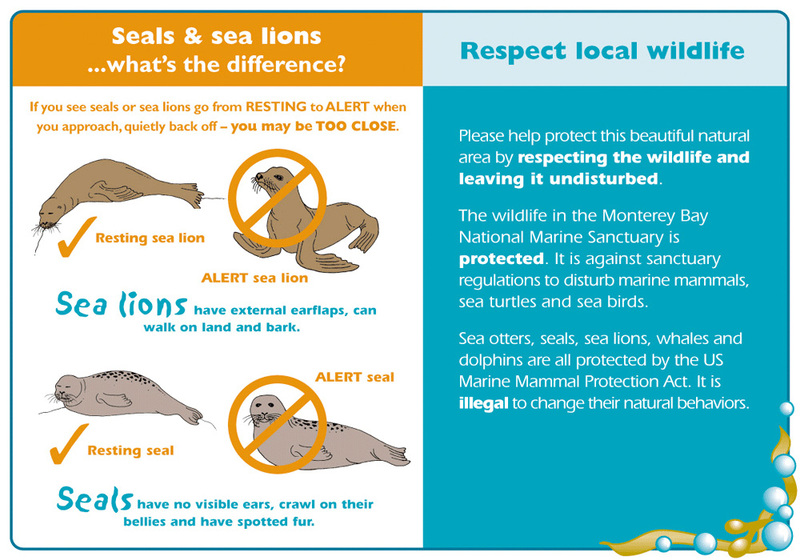 However, many visitors here are unaware that close encounters with sensitive wildlife, such as seals and sea otters cause big problems for the animals. Continual disturbance disrupts critical daily activities such as resting, eating, caring for young or grooming and can severely impact their overall health. That’s where our knowledgeable and passionate Team OCEAN and Bay Net shoreline volunteers play a key role — in fostering understanding and appreciation of the marine sanctuary, promoting respectful wildlife viewing and protecting marine mammals from human disturbance. The Sanctuary’s TeamOCEAN Program puts trained, knowledgeable naturalists out on the water in sanctuary kayaks to greet and interact with fellow day kayakers. The naturalists serve as docents for the marine sanctuary, promote respectful wildlife viewing and protect marine mammals from disturbance. A large percentage of ocean kayakers are visitors to the area and unaware of or undereducated about the sanctuary’s existence and sensitive wildlife. TeamOCEAN has proven to be a successful program with thousands of contacts per year. TeamOCEAN volunteers can be found in Elkhorn Slough in Moss Landing and along the kelp beds off Cannery Row in Monterey. Since the program’s inception in 2000, TeamOCEAN staff and volunteers have interacted with nearly 100,000 kayakers, all the while preventing thousands of potential disturbances to sanctuary wildlife. Since 1995 Bay Net volunteers have provided year-round shoreline interpretation for visitors, introducing them to local wildlife that can be easily seen from shore. Bay Net volunteers also educate the public to keep their distance from harbor seal mothers and pups at local pupping beaches. In 2013 alone Bay Net volunteers spoke with more than 36,000 people in Pacific Grove, Monterey and Santa Cruz, with the majority of contacts at harbor seal pupping areas. Help Give Sea Otters and Seals a Break!